297 spacious guest rooms, including 66 suites of which 12 are particularly suited to longer stays. Positioned on the 1st to 18th floors, most offer unobstructed panoramic views of the city and Mount Kassion, some guest rooms feature a private outdoor terrace for relaxing or dining. Experience Syrian fine dining in a luxurious, intimate restaurant features the best of the Aleppo cuisine of northern Syria, with specialties that combine European culinary sophistication with the excitement of Eastern spices. The well-appointed atmosphere reflects traditional Syrian character. Savour the best of Italian cuisine in a contemporary setting with traditional accents. An open kitchen features a country-style pizza oven. The restaurant is open for dinner daily. Pan Asian culinary delights and international steak house cuts with impeccable service, making for a unique dining experience. The restaurant offers breathtaking views of the city from its beautiful terrace, and features al fresco dining during the summer months. Unwind in an elegant, intimate bar, featuring an impressive wine list and quality spirits. Selections are available by the glass. For the cigar aficionado, cigars from all over the world are presented in special humidors. Complimentary snacks are served with drinks, and a small snack menu featuring hot and cold hors d'oeuvres is available. Enjoy light dining and the finest selection of international coffees and teas throughout the day. Traditional English and Asian afternoon teas are a highlight, and a decadent dessert buffet provides endless temptation from Wednesday through Friday. Pool Bar - Cool down with a healthy, refreshing beverage at the Pool Bar after a workout, swim or spa treatment. In the summer, enjoy your beverages around the pool and be pampered with Four Seasons poolside services. Pamper yourself with a relaxing or rejuvenating body treatment in the elegant surroundings of the hotel spa. Use the men's or ladies' steam rooms to melt away tension. Then, in one of five exclusive treatment rooms, let skillful massage therapists nourish and invigorate your body with traditional or innovative skin treatments. Unwind and revitalise in the fitness centre. In its quiet surroundings, train with state-of-the-art cardiovascular equipment and free weights, or engage a private trainer for your special needs. The Hotel's outdoor pool offers guests a relaxing swim or revitalising lap workout. Afterwards, enjoy a stress-relieving aquatic massage in the adjacent whirlpool. Poolside services include refreshing chilled towels and water spritzes. Snacks and refreshments are available poolside. The Hotel has 1,598 square metres (17,201 square feet) of stylish indoor function space, fully equipped with the latest in technology and supported by an unparalleled level of cuisine and service. The grand ballroom, with its soaring ceiling and magnificent chandeliers, can accommodate up to 600 for a banquet and 800 for a conference, and is divisible into five smaller function spaces. The next largest room, can seat up to 200, and is also divisible in two. 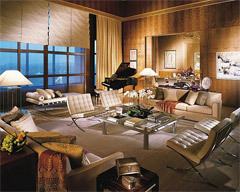 Three smaller rooms provide a warm relaxing atmosphere with soft, neutral colours, natural lighting and inviting views. A beautifully landscaped outdoor terrace provides a splendid backdrop for outdoor functions. Damascus International Airport (DAM): 25 minutes. Airport transfers and chauffeured hourly limousine rental are available from the hotel.